As the date of competition gets closer I hear so many athletes, and especially parents, talk of their eagerness to see the Psych Sheet! Where will you be ranked in your event, who is swimming against you, how many spots does my child need to move up to make consols, final or win? The psych sheet can be, for some, a great motivator but for many can become a psych OUT! It's important to begin to realize what the psych sheet does for you. Can you look at it, get a sense of where you are/what you need to do and then move on without obsessing? Or, do you begin to wonder how so and so will swim and who will scratch? These are all things you can't control so there is no use worrying about it. I believe the key is knowing how YOU need to swim your race; commit to the race strategy you and your coach have developed based off your strengths and weaknesses and then execute it. These are skills that should be practiced in a workout setting and then in smaller meets leading up to your championship meet. You won't learn about how you can race unless you try different strategies. 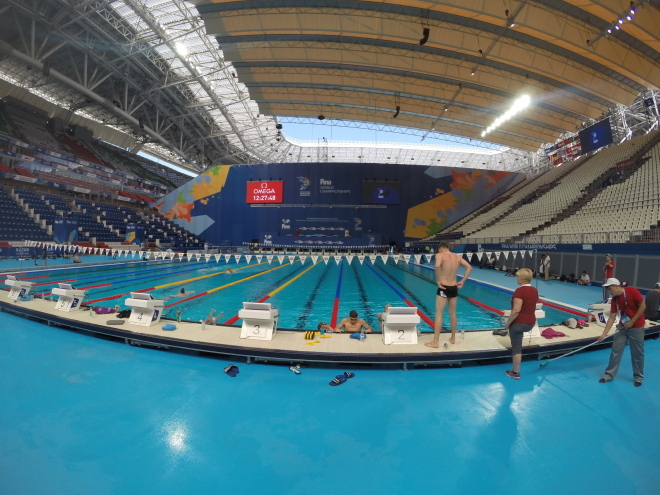 I asked a few athletes headed to the 2015 World Championships how they approach the psych sheet: do they look and look and look or, do they just skim it, better yet, do they even know it exists? I definitely look at it. I like to see who has entered the even because I study my competitors and how they race over the season. Once I check it out though, I put it away and don’t obsess over it. I definitely like to look at the psych sheet. It helps me get a feel of where I am seeded, as well as trying to figure out what circle seeded heat I’m in and who I am next to. I study it like it’s my job! It gives me peace of mind and a comfort to have an awareness of the situation. I like to see where I'm at and who's swimming. I like to look at the results more to see how everyone swam the race. As long as I've got my own lane I'm happy:) that's all that matters. Coach will tell me to do my own pace and not get distracted. Never look at it. Why should I? It doesn’t matter. (This is when I thought, “It’s Ryan, he doesn’t need the psych sheet…ever! }Not even as a kid did I look at it. I can be in lane 1 of the first heat or lane 4 of the last heat…the work is done. I’m not a big thinker when I’m racing. I don’t look at it. Once, as a little kid, I looked at it and really freaked out. My mom told me, “It (the psych sheet) doesn’t matter, you still have to race.” Ever since then I don’t bother with it. I stick to my own race plan. I avoid it altogether. A name doesn't win the race. I usually don't look too much into the psych sheet. If I happen to see it, then that's ok. I think one of the biggest things I learned in college under Steve (Bultman) and Tanica (Jamison) was to not focus on the end result (the time or place) but to place my energy and thoughts on race strategy, technique, and emotions during the "big race". Looking at a psych sheet can sometimes alter that plan. I ignore it. I don’t want to see if I’m way up there or way down there. I’m gonna be where I’m gonna be. I just look at the heat sheet to see what lane I’m in! If you know what you need, don’t get too influenced by those around you who may not be on the same page. If your teammates or parents are talking up the psych sheet and advising you on “who you need to beat”, let them know that isn’t the best strategy for you and you’d rather just focus on your race plan, regardless of who is in the water with you. Or, explain to them why it helps calm your nerves, gets you the right amount of excited and take a quick look at it. I recommend that you don’t look it over, and over and OVER! Remember to put your energy into the things you can control which, in general, is your level of readiness, your attitude and your effort. Swim smart and race tough!